If we had to play the same side every week, my first choice would be Fulham as where all teams have their strengths and weaknesses, I'd argue we trump Fulham in most areas. Similarly if there's one team we'd never have to play it'd be Everton as they are an impressive mixture of talent and a strong work ethic and have gained 10 points from the 4 league games against us in the Premier League without conceding a goal. Everton have the benefit of not having European football this season and a stable squad. 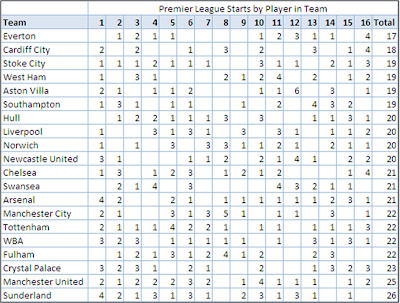 They are one of 3 teams (along with Cardiff and Chelsea) who have 4 players who have started all 16 league games (as of start of weekend) and have started the fewest different players (17). Swansea by comparison have started 21 different players and Sunderland the most with 26. With the extra 10 competitive games the Europa League has brought, along with a number of injuries to players it can be seen that 7 Swansea players have started 11/12 games (Chico has started the most -15 along with being a regular in the Europa League side). 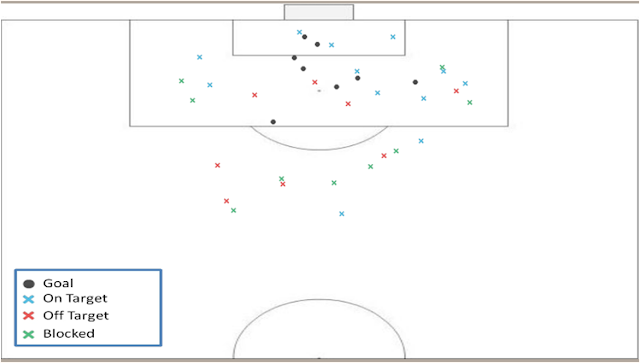 The main threat for Everton comes from Lukaku and as his shot map below show's he's pretty lethal in a central area. One possible source of comfort is that he hasn't scored in his last 3 league games (although Everton have taken 7 points from those 3 matches). With Rangel suspended, it'll be interesting to see if Dwight Tiendalli gets another game or if Jazz Richards gets thrown in at the deep end. I've no idea what to make of this match (I am for some reason though hugely optimistic about the Chelsea game), as good a season as Everton are having, I don't think they're invincible but injury worries mean the Swansea attack could be pretty much anything. As much as I'd like to see both Michu and Bony start, even if both were fully fit I wouldn't expect Laudrup to start with both against a side like Everton. For more previews of the match check out The Swansea Way and this on Grantland looking at the change of focus at Everton under Martinez.